Posts and pages can be assigned to multiple taxonomies and thus may unexpectedly show up in your sitemap when you thought it would be hidden. 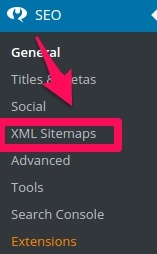 You can exclude individual posts or pages from the sitemap in the XML Sitemap settings. The 'SEO' settings will expand providing you additional options. Click on 'XML Sitemaps'. Click on 'Excluded Posts' and add the post or page ID in a comma separated list. Don't know the post or page ID. This article will show you how to find a post or page ID.